or click to submit a Quote Request. Promote your products and services, include coupons to capture attention, announce discounts and specials, grab new customers! 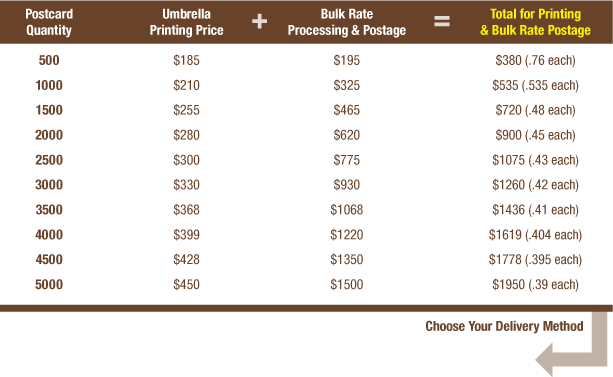 Use the pricing charts below to calculate your costs. Sales tax not included in pricing. Postage cost is subject to change without notice. Plan 1 - Delivered by You (no additional charge): The postcards are printed and delivered to your business. You separate the postcards into bundles of 50, affix the required Facing Sheets, and then deliver the finished bundles to the designated post office for mailing. Plan 2 - Delivered by Us (additional handling charge): The business can request Bundling and Delivery Service to the post office (the service is for Western Washington only). Add up to 3 additional business days for this service. 2-3 business days for artwork, 7 business days for print/delivery, 2 business days for bundle/delivery service to post office, 1 business day to distribute into mailboxes. Total = Approx. 13 business days. Plan 1 - Shipped to You ($10 charge): The Bulk Rate Mailing Service does not process mailing lists with less than 300 addresses. So, if an business' order is for less than 300 pieces, the postcards will be printed and delivered to the business' office. The business will need to label the postcards and use stamps or metered mail for postage. Plan 2 - Mailing & Delivery Service: We contract with a local Bulk Rate Mailing service. You supply a mailing list (usually as an Excel spreadsheet) or order a custom mailing list from our Mailing Service. The Mailing Service CASS will certify the addresses, label and sort the postcards, and deliver the postage-paid postcards to the post office. Note: The Business will pay Umbrella Graphics for the printing and design; they will pay the Mailing Service for processing and postage. 2-3 business days for artwork, 7 business days for print/deliver, 2-3 business days for post office to distribute into mailboxes.